Mixed-bed ion exchange systems are designed for industrial, high purity or ultra-pure (ultra high purity) water applications requiring only trace amount of dissolved solids. For ultra pure applications such as those in semiconductors, microelectronics, pharmaceutical or power generation, add a Liqui-Cel membrane contractor system for removal of carbon dioxide (CO2) before the mixed bed to greatly reduce chemical costs and increase efficiency. SDI or Portable DI (deionization) Exchange Tank Systems where the customer doesn’t have to handle chemicals or regenerations can be found in the link above. For on-site regeneration, individual tank capacity ranges from 43,000 grain to 403,000 grain with continuous flow rates of 10-1,200 GPM. Tank diameters from 16″ to 120″ and service pipe connections from 1″ NPT to 8″ NPT are available. Single and primary/polisher twin systems are available with a wide variety of hardware and instrumentation packages. Standard design assume use of 30% hydrochloric acid and 50% sodium hydroxide chemical for resin regeneration. Separate sources of softened water and compressed air are required for the regeneration process. 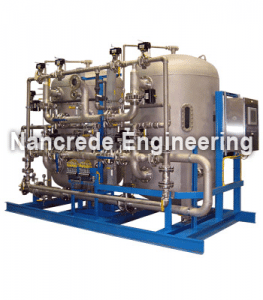 Contact Nancrede Engineering for information on larger tank sizes and custom sized applications. Heavy-gauge carbon steel pressure vessels internally lined with a chemically resistant vinylester coating. All exterior surfaces are coated with a acid and caustic resistant “Safety Blue” paint finish. Non-ASME construction with 100 psig working pressure. Flat-false bottom resin support with a hub-radial, non-clogging underdrain constructed of PVC for the ultimate in corrosion resistance. Resin interface lateral is 316 stainless steel. High capacity, strong-acid cation exchange resin in hydrogen-form. High capacity, Type 1 strong-base anion exchange resin in hydroxide-from (shipped in chloride form). Sch 80 PVC face-piping assemblies with thermo-plastic, normally-open, “Y” pattern diaphragm control valves. All control valves are air-operated requiring a 80-100 psig of clean, plant air supply. Pressure vessels are mounted on a structural carbon steel skid and pre-piped to the fullest extent for minimal floor space requirements and ease of installation. Comprehensive Programmable Logic Controller (PLC) system pre-wired in a NEMA-4X electrical enclosure. Includes all operator switches, push-buttons, indicator/alarm lights, and heavy-duty solenoids for control valve actuation. Panel-mounted system flow meter and DI water resistivity monitor with digital display. Pre-assembled system pressure gauge and sampling valve center. ASME constructed, stamped, and certified pressure vessels for varying working pressures. Automatic low/no flow recirculation pump systems. Primary/Polisher twin systems for the ultimate water purity (16-18 Meg-Ohm). Automatic alternating systems for continuous service. Sulfuric acid regenerated cation systems. Instrumentation additions include flow totalization, pH, and chemical percent meters. Touch-screen operator interface terminals in lieu of lights and switches. Forced-draft decarbonator towers for CO2 reduction pre-treatment. Product water storage tanks and re-pressurization pump systems. Waste chemical neutralization systems with automatic controls. Multi-media, activated carbon, and reverse osmosis pre-treatment systems. UV sterilization and sub-micron filter post-treatment systems.